Enjoy boating, fishing, sailing and a nice walk out to the lighthouse. This vacation rental is the perfect location. Welcome home to Cobblestone Cove 2, a 2 bedroom, 2 bathroom villa with incredible Lake Superior views in Grand Marais. Cobblestone Cove 2 is located in the Cobblestone Cove Villas in the heart of downtown Grand Marais. 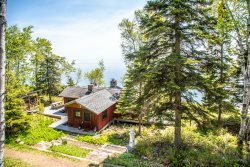 Just a short stroll away and you are at the shore of Lake Superior facing the Grand Marais Harbor. This is the view from the patio of Cobblestone Cove 2 - great views of Lake Superior and Boulder Park. The living area of Cobblestone Cove 2 is bright and open. The gas fireplace creates winter time ambience and the flat screen TV provides entertainment. The living room, dining room, and kitchen all flow together to create the open living space. The large, modern kitchen is a favorite. The custom cabinetry, granite countertops, and stainless steel appliances make Cobblestone Cove 8`s kitchen an ideal one for any chef. The lower level features a half bath between the living room and kitchen. The master bedroom features floor to ceiling windows that let you take in the Lake Superior views from your queen sized bed. The guest bedroom has a queen size bed and views of the town of Grand Marais. Master Bathroom is located in the master bedroom. It features a shower/tub combo. The attached guest bathroom provides plenty of privacy for all guests. This bathroom also features a shower/tub combo. Enjoy privacy on Cobblestone Cove 2 patio located off of the living room. Sit back and enjoy the Lake Superior views. The beach at the Grand Marais harbor is just steps away Stay at Cobblestone and experience the best of Grand Marais from walking distance. Beautifully designed and appointed, these lakeside vacation homes boast full kitchens with stainless steel appliances, 2 gas fireplaces (one in the living room and one in the master bedroom), private decks and patios overlooking Lake Superior, vaulted ceilings, and breathtaking views of Boulder Park, Grand Marais Harbor, and Artist's Point. You are easy walking distance to the many shops and restaurants that have helped make Grand Marais a quaint and peaceful destination year round. You are also just a short drive to several state parks and miles of hiking and mountain biking trails. Lutsen Mountains Ski Resort and Summer Recreation area is just a 20-minute drive away. The condo was beautiful with gorgeous views of the lake, centrally located and convenient to explore Grand Marais. I particularly loved the giant window in the master bedroom. This townhouse was wonderful! Location was great. Within walking distance to great restaurants, breweries, walks in the beach, and shopping. The beds were comfortable and sheets were nice. Living room furniture was also very comfortable. All around great place to stay in a wonderful town!